While the stupid money Tianjin Quanjian threw around in hopes of luring Alexandre Pato to China’s second division were shocking enough, they weren’t actually all that much of an outlier. China’s soccer teams have quietly been vacuuming up talent at exorbitant costs for a while now, and with a raft of established, European-caliber players at or near their primes heading eastward this transfer window, it’s becoming clear that China is very serious about featuring some of the world’s best. Consider these moves, all from this transfer window: as of yesterday, Jiangsu Suning reportedly put the finishing touches on a £20 million transfer for Chelsea’s 28-year-old midfielder Ramires; about a week ago, Jiangsu Suning had all but locked up AC Milan’s 28-year-old striker Luiz Adriano, only for him to nix the deal at the last minute when the contract language was off; Newcastle’s 29-year-old midfielder Cheik Tioté similarly seemed all but locked in for a move to Shanghai Shenhua before that deal broke down, though reports say he’s still likely to join another Super League club; today, Hebei China Fortune announced the signing of 28-year-old Roma forward Gervinho. That’s a good number of very capable European players (plus Cheik Tioté) totally willing to leave some of the most prestigious leagues and clubs in the world in favor of joining a basically anonymous league in a country with a radically different cultural base. Pato can’t be the only one these teams are piling money upon. You may have noticed that in the list above, the named players have a distinctly Brazilian slant. Indeed, the Super League has targeted Brazilian players, and if the departure of players from Europe to China looks like a mini-exodus in the making, the transfer of guys from the Brazilian league to China looks more like the rapture. As the South China Morning Post explains, under the headline “The sack of Sao Paulo,” Chinese teams have plundered reigning Brazilian Série A champions Corinthians this month, buying up four of their key players: Gil (28) to Shandong Luneng, Jádson (32) to Tianjin Quanjian, and Ralf (31) and Renato Augusto (27) to Beijing Guoan. Augusto is the highest profile of this batch, as he had previously amassed 101 appearances for Bundesliga club Bayer Leverkusen and chose Guoan’s offer over one from Champions League regulars Schalke. It probably doesn’t hurt that, according to the SCMP, he’ll be earning over €100,000 per week. The recent Corinthians raid—oh, and that club’s manager, Tite, reportedly turned down a coaching offer from China of his own—is only the latest example of this trend. Robinho, Diego Tardelli, Luís Fabiano, Walter Montillo, Ricardo Goulart, Marcelo Moreno, Aloísio, Wágner, Hernán Barcos, Geuvânio—these are some of the best players from the Brazilian league who have jumped to China over the past couple years. And that’s not even counting guys like Demba Ba, Paulinho, Mohamed Sissoko and Alessandro Diamanti who made their way to China straight from Europe. Toss in managers like Felipe Scolari, Mano Manezes, Alberto Zaccheroni, Gregorio Manzano, and Vanderlei Luxemburgo, and China also offers an array of coaches who’ve held the reigns at some of the biggest teams across the globe. It’s insane when you really look at it how many quality players and managers who very easily could still be plying their trade in much more prominent leagues have made their home in the far east. Where does this money come from, you may wonder? Most of the top clubs who employ the names listed here are owned by enormous, multi-billion dollar Chinese corporations. These aren’t a handful of billionaires with lots of free time and discretionary cash at hand; these are entire companies, often state-owned, that generate hundreds of billions in revenue and have decided to siphon some of the runoff into overpaying soccer stars to forsake competition at the highest level in favor of competition at the highest salary. 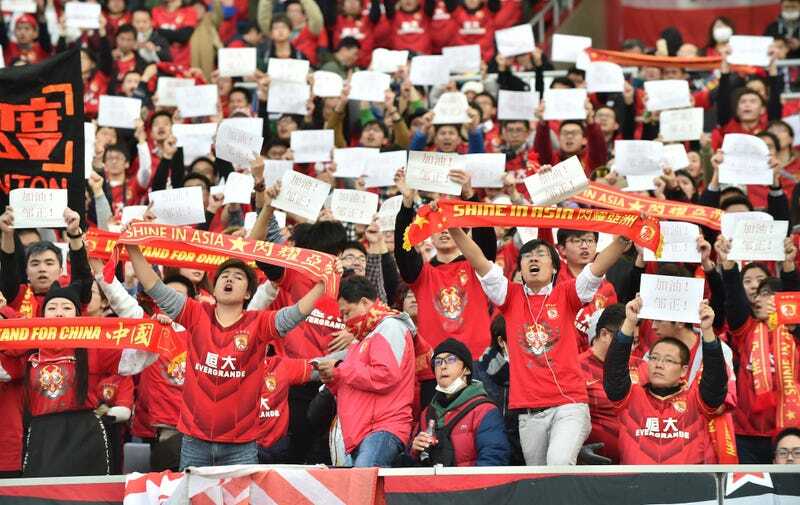 It will be fascinating watching how—if— the Chinese Super League grows going forward. Will we continue to see increasingly big names eschew Europe for the fat paychecks available in China, or will this period be remembered as a fad? After all, Didier Drogba and Nicholas Anelka were big-name players who went to China as recently as 2012, only to go running back to Europe at the first opportunity. With these moves, coupled with an increase of Chinese ownership of traditional soccer powerhouses, and sponsorship agreements like this one that Chinese company Ledman signed with Portugal’s second division, which requires the top 10 teams in that league to sign and feature at least one Chinese player, China is strengthening its grasp on soccer. Whether it can hold on is an entirely different question.